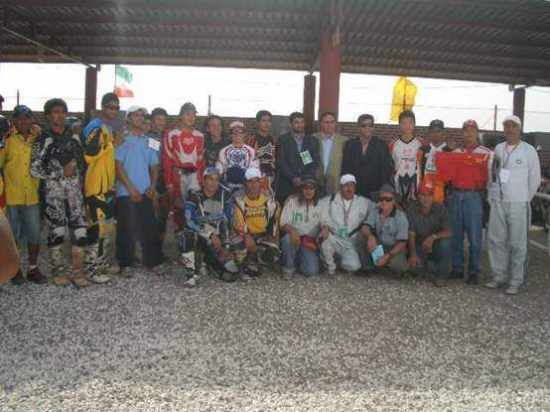 Iranian Riders competed in Round 1 at Puerto Princesa City, Philippines on Feb 24th and four Months later their National Motor Sports Body, MAFIRI hosted Round 2 complete with covered Grandstand, double story Timing/Jury building, Bike Wash, permanent concrete/brick pit facilities, concrete start pad, inbuilt track watering facilities on the 1.1 Km purpose built track and live television organised for two days to cover the feature races and Qualifying periods. Commencing with Rider arrivals, MAFIRI was the epitome of efficiency with personal Airport meeting then transport direct to the official Shahr Sanati Kaveh Hotel. All meals including Welcome and Awards night were in the hotel, with Riders bussed both ways for the 10 min trip – even for lunch ! New Countries entering the Iran Round included China , India , Sri Lanka , and German Tycho Leske with UAEMC documentation, as well as regulars from other Asian Countries. Transponder times for Wednesday Free Practice 1 produced China ’s Shi Yumeng on top with 1:18.892, before Philippines Kenneth San Andres topped him in Free Practice 2 with a 1:17.757. 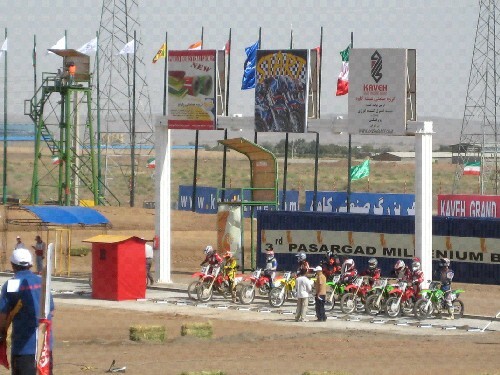 Thursday Official practice went to Khaliunbold on 1:16.119 before the late afternoon Qualifying period when Iran’s Mojtaba Karimzadeh scored fastest time with 1:14.463 after Khaliunbold, Kenneth and Indonesia’s Iwan Hermawan were disqualified for allegedly course cutting. Right from the first lap it was Khaliunbold all the way. San Andres held 2nd place for the first 7 laps before Karimzadeh got past him and then it settled into Khaliunbold, Mojtaba, Kenneth, 15yo Iranian Rider Amir Sabetifar, Iwan. On the 12th lap Iwan made a move on Amir – didn’t make it, then dropped back. A triumphant Khaliunbold took the chequered flag on the 19th lap after lapping up to 7th place and setting a blistering fastest lap of 1:14.727. Second was Mojtaba. Third was Kenneth San Andres. Fourth Amir Sabetifar and rounding out the top five was another Iranian Rider Vahid Shahbakhsh. A small delay in the waiting zone while the Live Television connection was established, then onto a clockwork start procedure by the Iranian officials. 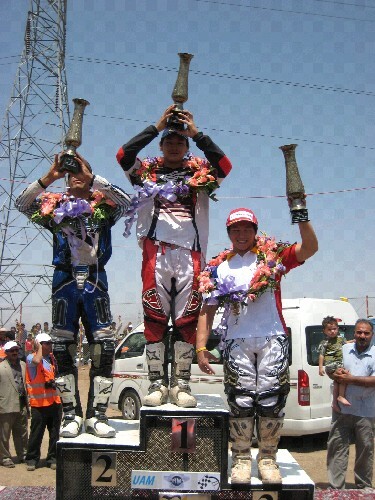 This time it was San Andres - Kawasaki in the lead on the first lap followed by Sabetifar-Honda, Erdenebileg-Kawasaki, Karimzadeh-Honda, Shahbakhah-Suzuki, however by lap 2 Erdenebileg and San Andres were in their customary 1st and second positions followed by the two Iranians Sabetifar and Karimzadeh with Hermawan-KTM in 5th. On lap 6 Karimzadeh got past Sabetifar on a RH berm although the youngster gave no quarter as the Freestyle exponent pushed past. 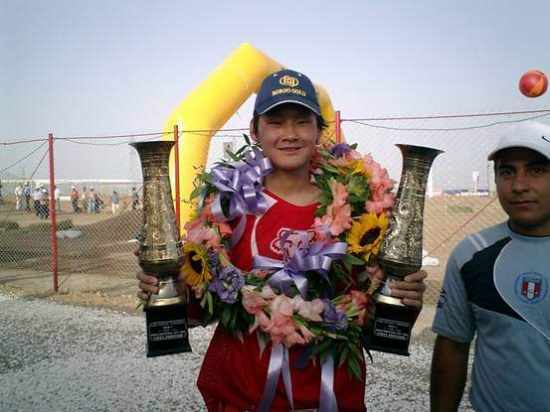 Meantime Indian Rider Santosh C.S.-Suzuki was making amends for his 13th place in Moto 1 and passed Hermawan on the 8th lap and San Andres on the 15th lap, but it was still Erdenebileg’s race as the affable Mongolian battled through with no tear offs. 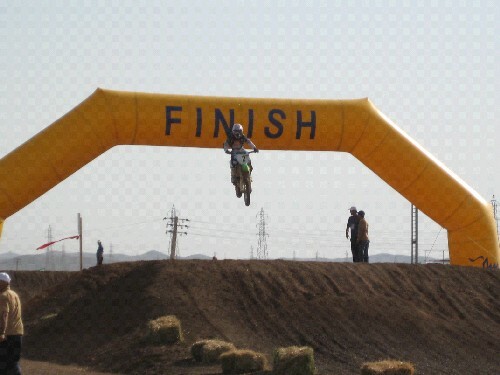 On the 18th lap the chequered flag went out for Khaliunbold as he made history for Mongolia by not only winning one Moto, but a double victory at an Asian Continental Union Championship. Second and third was Mojtaba and Amir in that order, with Santosh in 4th after a brilliant ride, and Kenneth feeling the heat, rounding the top 5. 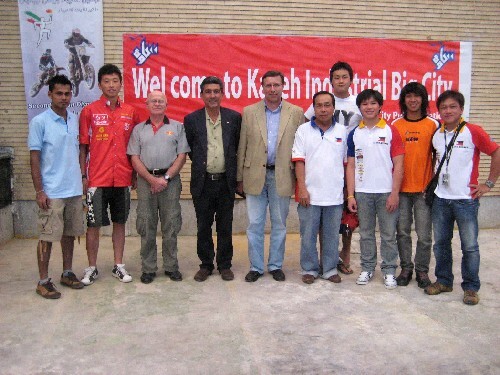 ROUND 2 RIDERS AT THE KAVEH INDUSTRIAL CITY CIRCUIT COMPLEX.